Greenery wrapped around the columns in front of our home got stale. I am a big Christmas decorator, so the first homemade column wrap was born. After a trip to the local fabric store for vinyl, my sister-in-law and I made my first toy soldier column wraps. It took us the entire weekend. After many visits from neighbors and people walking up to my door and asking where I got my toy soldiers, I decided maybe I was missing out on an entrepreneur opportunity. Allen Home Design was born. After partnering with my son Scott, we took the design for the toy soldier column wrap to China for the first run production. Doing business overseas is not easy, and the long lead time and troubles with quality control were a problem. The first order of column wraps arrived and filled my garage. I was amazed at how quickly that first order was sold. It was too late to order more for the season, so we rethought our production process. Made in the USA. Yep that’s what we wanted for our column wraps. After finding a local manufacturer, we were able to work with them on new designs and grow our business even more. My son was an integral part of the design expansion. His artistic creativity and website knowledge helped Allen Home Design grow and branch out even more. This year has been a busy one! 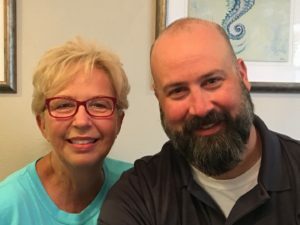 With my son Scott heading up the effort, we totally redesigned our website, added new designs for column covers, and added some home decor accessories. The relaunch of our website has been very successful, Our business grows every year, mostly by word of mouth. As a small business, our advertising budget is small, so we have depended on our customers to spread the word. Thanks to all of you for helping Allen Home Design grow into a thriving business. Allen Home Design is owned and run by Cathy Allen and Scott Allen – a mother and son team. Cathy created Toy Soldier Column Wraps for her own home in 2008 and after many requests for her to make them for friends and neighbors, she contacted a manufacturer to begin producing greater quantities and better quality at a lower cost. Scott handles all creative for Allen Home Design, from this website to Huggits™ illustrations (other than the original Toy Soldier). In 2015, Allen Home Design moved all manufacturing to the United States. All designs, printing and shipping are handled in the United States, allowing us to proudly state “MADE IN THE USA”. Huggits™ Column Wraps are all weather, vinyl decorations for your home. They an be used on round columns, square columns, double post columns, or to cover unsightly telephone pole in your front yard – local authorities permitting. There are no hardware attachments required and you will not need to modify your column whatsoever. 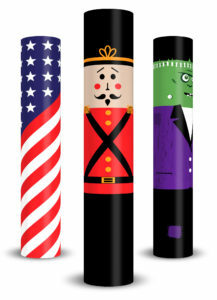 We want to make sure you get the perfect size Huggits™ Holiday Column Wrap for your home. The old adage – measure twice cut once should definitely be applied to this product and purchase. There are two measurements you need before deciding which size to purchase. Circumference and height. To measure circumference of your column/pole/post, use a fabric measuring tape and measure all the way around the column (like you are “hugging” it) at its widest point. If your column is much wider in the middle, the you will need to measure it at the smallest point as well. When ordering, make sure your measurement is within the circumference range of the listed product, and make sure the height can be accommodated as well. All of the Huggits™ can be trimmed in height up to 12 inches to fit shorter columns. Because of the high demand of our holiday Huggits™ Column Covers, we have had many customers ask for more in the Home Decor area. We listened! 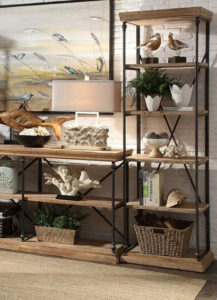 Allen Home Design partnered with Crestview Collection and are offering an assortment of Home Decor items, including lighting, wall art, accent furniture and home accessories. Allen Home Design is committed to giving our customer quality merchandise at a very affordable price. As you look through our collections, realize the selection will change as fashion so often does. We are grateful to our broad customer base, and hope you enjoy our new Home Decor selections.